This can be located by pressing a code allowing you to play a hidden game and then entering "BHA" as the password. AZY is the pseudonym used by the game's programmer, BIGNET seems to have been another name for Micronet, the developer and Japanese publisher of the game. My question is, what does this screen show? Are these names? Looks like a list of more codes? I've never played the game, so I can't help you beyond that. Thanks for the help. This is really odd, because you only get three spaces to enter a password with roman letters and numbers, so none of those (besides AZY, which is used to reach the hidden game) fit. I've tried using them as names in the RPG modes and they have no effect there either. I'm not sure either, but I'm thinking めんとばし might be 面飛ばし. Something like "to blow away the mask" (take it right off) or to "launch the mask" (throw?) EDIT: I assumed this was "mask" but it could be face as well considering the following. EDIT: I did a little searching, and I could only find this in the search result text. Not on the page it referenced, nor its cached version. ". Battle Fantasy ... Register as "BIGNET" with a name entry that easily defeats enemies. Then start the game with operation BHA and select "BIGNET" by name select. Now you can defeat the enemy by pressing the start of the 2P pad during play. ○ Another logo appeared When you turn on the power and the SEGA logo appears, press and hold up, start, A and C. Then, the big net logo appears instead of the micronet logo. 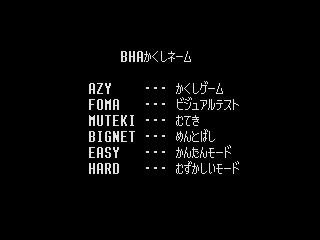 ○ Register "MUTEKI" as an unbeatable name entry and play the game with Operation BHA ..."
filler - So those are cheat codes for Micronet's previous game, Black Hole Assault! The 2nd controller thing is listed on gamefaqs. https://www.gamefaqs.com/segacd/587926-black-hole-assault/cheats Kind of cool that they hid codes for another of their games in there, too bad BHA is so awful though. Who knew! I love all these strange mysteries we're solving recently. Glad we got to the bottom of it. Dunno if it's already been mentioned, but めんとばし most likely means something like "stage skip". Yup, it's a stage skip code.